If you weigh yourself by standing on a bathroom scale, not liking the result, then balancing towards one corner to knock a few pounds off the dial, you are stuck in a previous century. Modern bathroom scales have not only moved from the mechanical to the electronic, they also gather body composition measurements and pack significant computing power. Yet they’re a piece of domestic electronics that sits in our bathroom and rarely comes under scrutiny. How do they work, and what do they contain? The team at November Five tore down a top-of-the-range Withings Body Cardio scale to find out. After a struggle with double-sided sticky pads, the scale revealed its secrets: a simple yet accomplished device. There are four load cells and the electrodes for the body measurement, and the PCB. On the board is a 120 MHz ARM Cortex M4 microcontroller, a wireless chipset, battery management, and the analogue measurement chipset. This last is particularly interesting, a Texas Instruments AFE4300, a specialised analogue front-end for this application. It’s a chip most of us will never use, but as always an obscure datasheet is worth a read. The rather pretty fractal antenna. 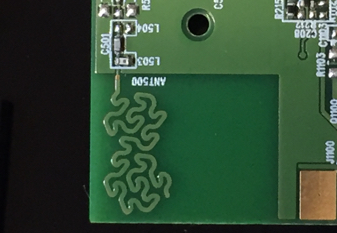 Finally, the wireless antenna is not the normal simple angular trace you’ll be used to from the likes of ESP8266 boards, but an organic squiggle. It’s a fractal antenna, presumably designed to present a carefully calculated bandwidth to the chipset. A nice touch, though one the consumer will never be aware of. We’ve shown you quite a few bathroom scales over the years. There was this wisecracking Raspberry Pi scale, this scale reverse engineered to gather weight data, and this one laid bare for use as a controller.